A founding member of 4Hero, Dego is a true original and living legend. A chameleon with it comes to production, Dego has taken hand in influencing and spearheading new styles and movements ranging from Jungle, Drum & Bass, Broken Beat, Hip-Hop and Soul. With aliases and projects like Tek 9, Jacob's Optical Stairway, DKD and Silhouette Brown among countless others, he's solidified his place as a master of music. His latest release is the follow up to the self-titled modern soul classic, Silhouette Brown. Written and produced by the trio of Bembe Segue (The Politik), Kaidi Tatham (Bugz In The Attic) and Dego, "Two" provides the high quality soul presentation you'd expect from such established names. Silhouette Brown's "Two" is available now on 2000Black Records. Dego is currently putting in work on the much anticipated solo LP, more details should be announced in the coming months. 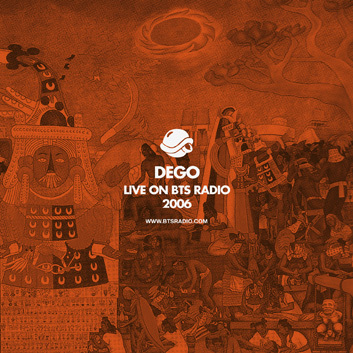 Airing live on Andrew Meza's BTS Radio in 2006, this is Dego's first guest mix for the program and often cited as one of the show's early highlights.